From the get-go tonight, Luke drags his feet over the required volunteering. He’d even join Claire for “Take Your Daughter to Work Day” to get out of it. Luke: I’ll go to work with you, Mom. Phil: Stop trying to get out of community service. You need those hours to graduate. Claire: And you’re not a daughter. Luke: Mom, Dad, sit down. There’s something I need to talk to you about. Luke does go – along with Phil and a group of boys, including Manny – but his heart is not in it. Phil: Okay, men. Gather ’round. Teachable moment. Don’t think of community service as a requirement. Think of cleaning up this park as an opportunity. Phil: To make the world a better place. Manny: That’s why I’m here. I already did my required hours. Luke: That’s a fancy way of saying you’re a virgin. Manny: Joke all you want, but this looks good on an application to NYU or UCLA. Phil: Okay, stop trash-talking and start trash picking-up. Things then go from bad to worse. And it’s not just trash-talk. 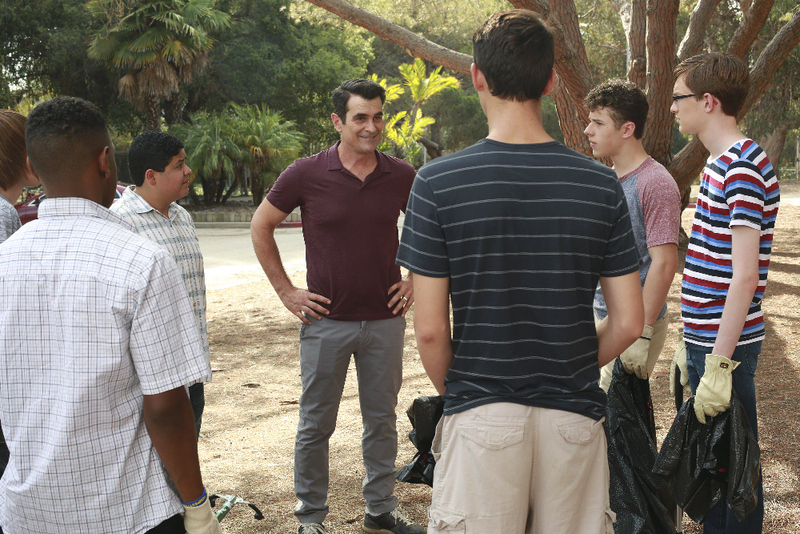 A car gets trashed – right after Phil gathers everyone around for one last teachable moment. Phil: I guess the answer is nothing. Nothing separates us from animals. Grow up, Manny. Human beings are basically terrible. Many high schools – like the one Luke and Manny attend – have made volunteering a graduation requirement since the 1990s when federal laws and funds began supporting it. Yet, when surveyed, most young people say they’re opposed to required community service. And there’s the rub. Our kids will reap nothing from volunteering if their hearts aren’t in it. But there are lots of benefits to be had. –	Grow in responsibility because people depend on them. –	See what life is like for others and build a heart for helping others – elderly people, people with disabilities, sick kids, people in financial distress. –	Explore their interests. They may even develop a passion that helps shape their ideas about a career they might not otherwise have considered. –	Build new relationships. When working on long-term projects, these connections often develop into close friendships. –	Demonstrate a meaningful use of their free time. A passionate involvement in a few activities can show dedication and responsibility. Although challenging high school classes, grades that show strong effort, and solid scores on ACT or SAT are at the top of the college checklist, extracurricular activities including volunteering and community service are also high on the list. –	Write a college essay. Writing about work done based on a cause that matters deeply to them can help students show colleges what they believe in and highlight their character, values, and goals. –	Earn an extra letter of recommendation. A recommendation from a community leader or a supervisor who knows a student well can put a spotlight on a student’s passion, special skills, and positive character traits. Years ago Ralph Waldo Emerson said: Nothing great was ever achieved without enthusiasm. This is certainly true when it comes to service learning. If our kids resent having to put in the time or just go through the motions, they’re likely to get less than nothing out of the volunteer experience. Most teens could probably care less about Emerson’s words from long ago. But we moms might want to keep them in the back of our minds. What is something you really care about? What would make it fun? Who would be fun to do it with? What would make it interesting? What would make it meaningful? What would make it count the most on a college application? For additional help with the picking process, checkout the teen website dosomething.org (click here).